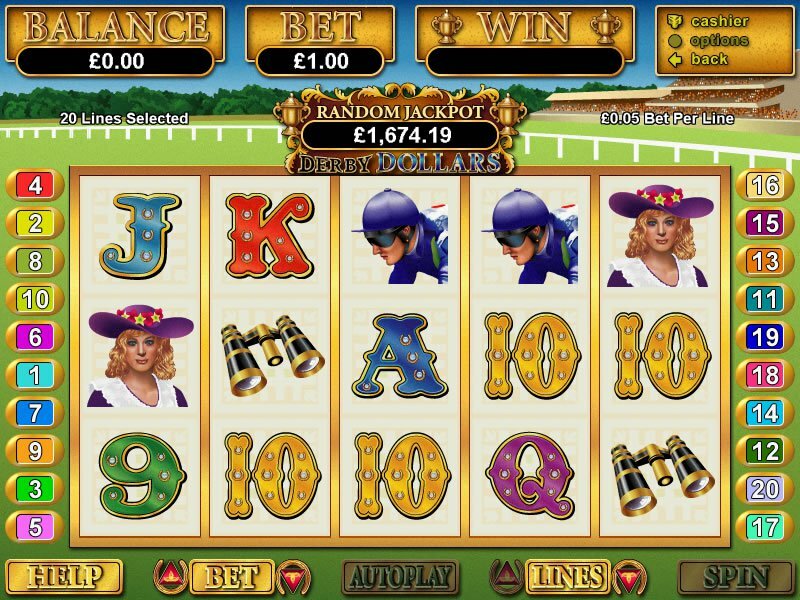 Derby Dollars is a fun slot that invites all users to visit racing with the best horses and the most luxurious society. It was developed by RealTime Gaming and offers a 5-reel, 20-line experience with a great opportunity to win the grand jackpot of 3,333 coins. Come play the Derby Dollars game at Slots Plus Casino. Users can activate free spins with the chance to win the top award of up to 9,999 coins! Don't forget about our progressive jackpots that can be hit randomly after any game. There are tons of options to win, so don't miss your chance at going big! You can participate anywhere that there's an Internet connection, and you don't need to download special software. We offer a wide array of great prizes for choosing the best combinations, such as icons like Binocular, Coin, Cup, Jockey, Horse, Lady, Ace, King, Queen, Jack, Ten, and Nine. These will all present you with different options for getting the prize. Every time you hit the wild, scatter, or Free Spins bonus you will be treated with exciting sound effects. You can only play this kind of Derby Dollars game at our Slots Plus Casino. The coin sizes offered are numerous. The smallest bet is $0.01, and the highest is $5.00. So players with any kind of budget can afford this game. You can bet one per line up to a maximum bet of $100. The scatter symbol is the coin with the horse's head on it. If you hit 2, 3, 4, or 5 scatters, you can multiply your bet by 1, 3, 15, or 50 times accordingly. The horse icon can also activate free spins, where you will get 5, 10, 15, or 25 free spins for hitting the same coins as the scatter bonus. All the prizes are tripled during free play. Also, extra wild and scatter symbols are added to increase your chances of winning! Random progressive jackpots are displayed above the reels after every pull. So, even making little bets can garner huge gains. The Derby Dollars game at Slots Plus Casino is a machine for people who want to combine the excitement of online video slots with the great atmosphere of first-class horse racing.